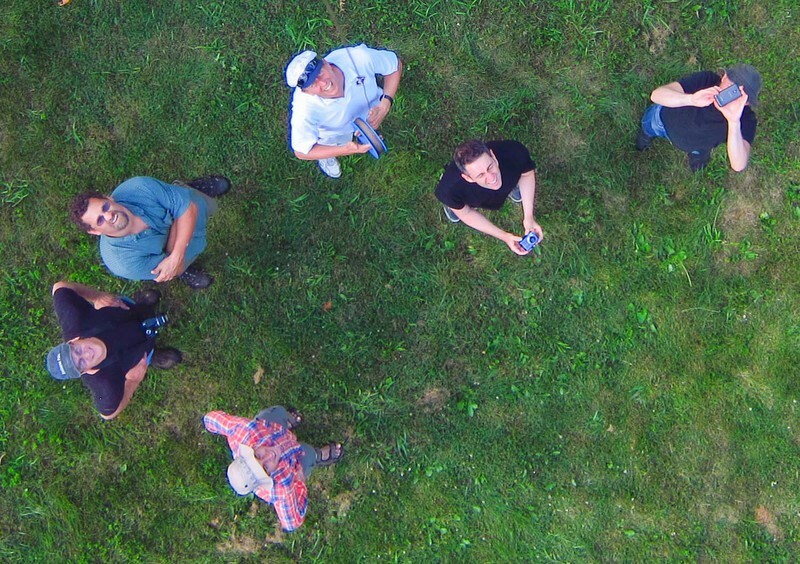 Image above: Monday’s WATERCHESTNUT crew as the big balloon landed after a 2.5 hour flight. 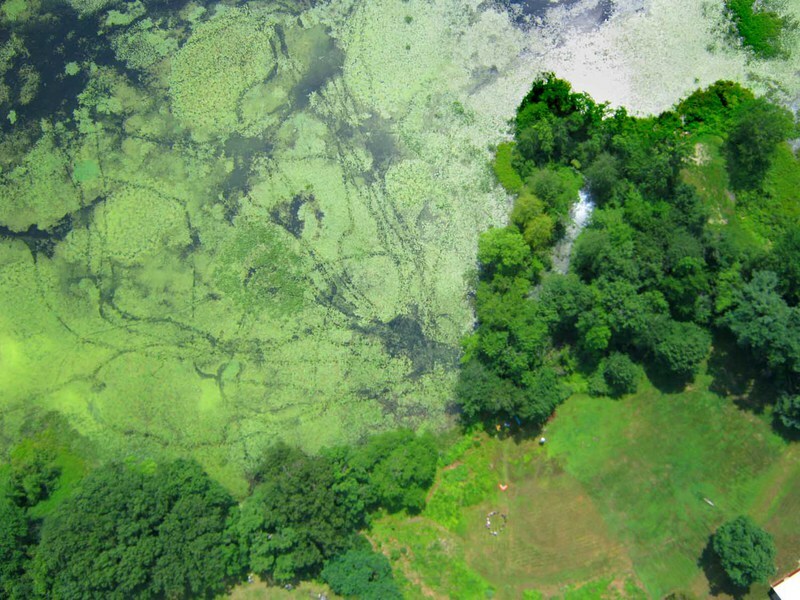 Half of these people were tasked with harvesting the invasive water chestnut from Lake Warner, and the others tried to document the extent of the invasion using aerial photography. Galen and I drove down to Amherst, MA on Sunday where six Public Lab organizers and staff members and lots of Pioneer Valley friends gathered to share skills and put them to use. On Monday, we joined a project organized by the UMass Department of Environmental Conservation and the Center for Public Policy and Administration and the US Fish and Wildlife Service that was testing aerial identification of the invasive aquatic water chestnut (Trapa natans) and pulling out the weeds (in that order). The event was organized by Don Blair, a Public Lab organizer and ringleader of Pioneer Valley Open Science, and hosted by Jake Wheeler at his HackerFarm01007. It was a huge success in many, many ways. Thanks much to Don and Jake and Cynthia and Charlie and Nate for the impressive coordination and cooperation. 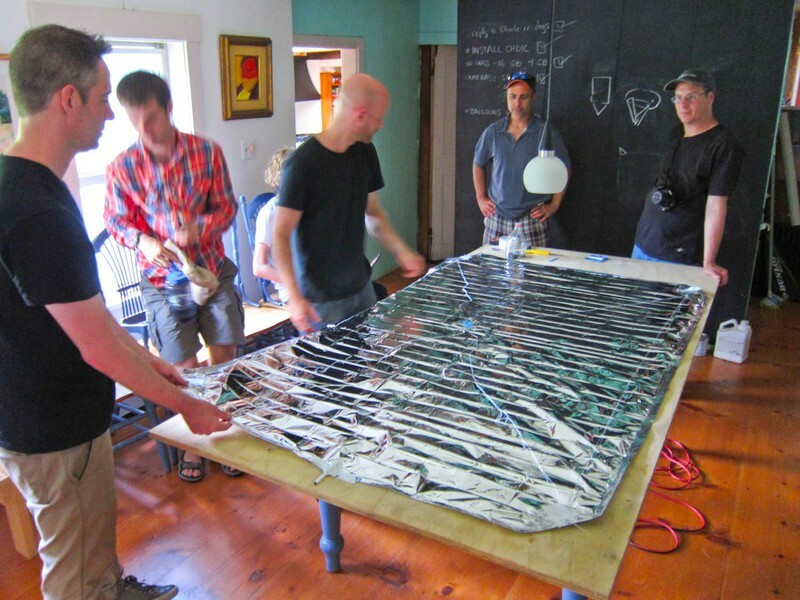 Don (left) and Jake (center) complete the construction of the HackrBlimp. This flew various cameras over the next two days. It's construction deserves an instructable note here. I have some photos, anyone else? Galen tethering HackrBlimp (and a dragonfly?). The blimp held about 35 cubic feet of helium and had four attachment points. Dragonflies were very interested in perching on the line. 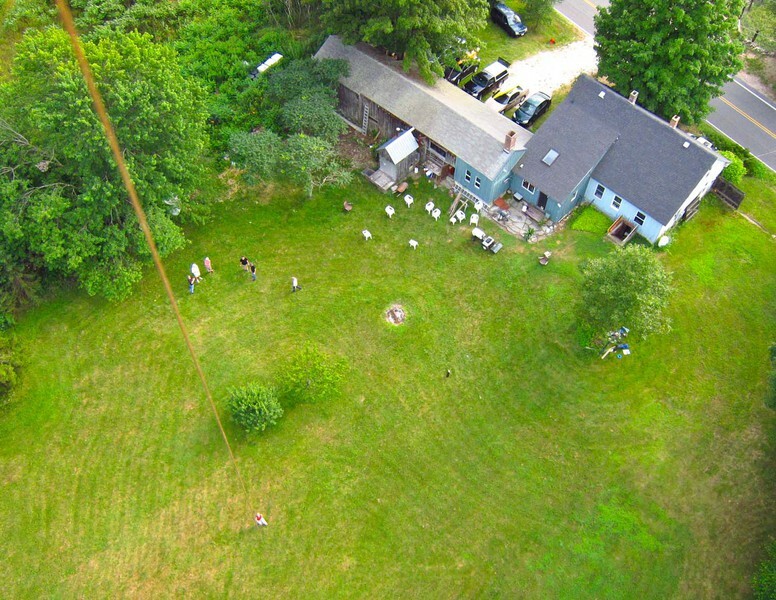 Some of Sunday's crew as HackrBlimp ascends at HackerFarm. It would be good to see some of the other photos taken on Sunday. 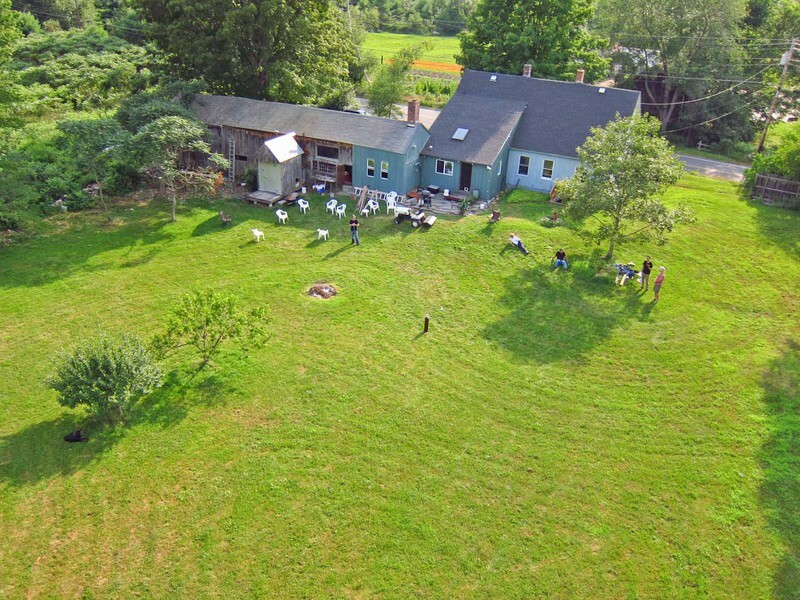 HackerFarm from HackrBlimp. This is one of 590 photos taken by a Canon S95 on a fixed rig during a 1.3 hour flight. The rig was walked down several times during the flight and the camera pointed in different directions (including vertically). So there is some map stitching and aerial panorama stitching to do. Cynthia is flying the rig here. Reviewing these photos Sunday night on a huge TV inside the 1797 structure, we noted how conspicuous the white plastic lawn chairs were. The next day, Charlie brought several to scatter in the lake prior to aerial photography so there would be better ground control points. The little tables make even better GCPs than the chairs. The cove of Lake Warner that was documented and then cleaned of water chestnut on Monday. 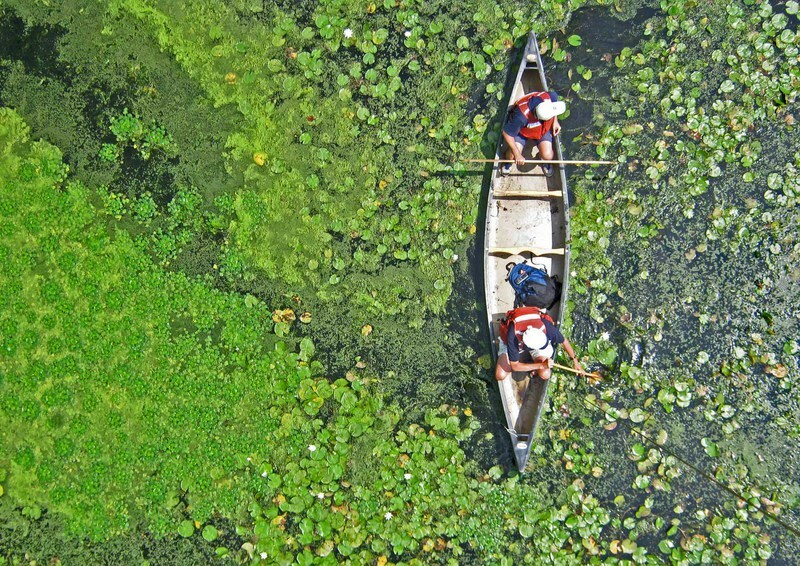 The dark streaks are canoe trails through floating-leaved aquatic plants including rooted and free floating species (it is mostly water meal and algae that are not rooted). The goal is to use photos like this, and infrared versions which we also captured, to locate patches of water chestnut as part of the much needed yearly monitoring to prevent the plant from spreading. Can you identify water chestnut in this photo? A very low altitude photo of the balloon-flying canoe passing a large patch of water chestnut (left). A dual camera VIS/NIR rig was flown under a five foot diameter neoprene balloon with about 55 cubic feet of helium. Initial inspection of the photos suggests that water chestnut has both a color and texture that could be distinguished algorithmically from other plants. We were very pleased with the results of this reconnaissance mission. Great summary Chris! Enjoyed working with everyone over the last couple of days. Started working on some panoramas last night. Will post that and any mapknitter work soon. Appreciate the prompt research note! Great post -- shall we start sharing our photos? I handed mine over to Galen. I've got some photos to share of the event too. How can we share them? I need one with a picture of the balloon above the canoe -- anyone have that? Great summary Chris. It was a real pleasure connecting with all of the folks at PublicLab, and also with Jake at Hackerfarm. Thanks again Don for doing so much of the organizing. I look forward to more collaboration in the future. Here at UMass, we plan to stitch some of the images together, georeference them, and then connect the field data we collected to do a supervised classification of the images. I'm not sure when we'll have that all done. Probably sometime in the Fall unless someone wants to help us with the image stitching. I'm chomping at the bit to do this work -- wish my other work wasn't in the way of it! Jeff, Galen is not aware that he has your photos. Did he put them on his netbook? Charlie, I am looking at a few of the high elevation RGB photos of the cove and trying to stitch them in Photoshop. I think it requires a few steps because I can't see the lawn furniture in the highest photos. I will post a research note when I get the process figured out. I will try to make a torrent to share the aerial images, but there are a lot and most people who don't already have them probably won't want them all. However, I added the GPS coordinates of the bottom end of the balloon tether to each of the 1600 jpeg files (VIS and NIR). The GPSr was always with me, so when I (on shore or in the canoe) am in the photo, my lat/lon is in the photo header and I become another ground control point. But sharing snapshots would be great. Maybe put them at Flickr with the tag H2ONUTZ? Who wants to hound everyone to do that? Flickr has been uglier than ever recently... but yeah. I just remember that as soon as our camera came down, Galen asked for the SD card. But failing that, it was Don's card, so he probably has it. Oh, I probably got those photos directly from Don's SD card later. I have not been to Flickr for a while. What happened? The idea of you, in the canoe becoming a GCP is a really neat idea Chris. We can see you in those high elevation images. So after the images are stitched together we can use that data. What must be hard though is the time stamp and the GPS coordinate time stamp. So we've learned that syncing the clocks on the camera and GPS unit at the beginning is really important, huh? Were the RGB and Infrared camera clocks and picture snaps time synchronized to one another? We got really lucky with the sync. When I got home I found that both cameras were less than a second from the GPS time signal. I had set the camera clocks a few days ago, but it is just luck that they were that close. So the lat lon of my day pack is now written in each jpeg (whether the day pack shows up in the photo or not). Nice work, all. It will be interesting to see the followup results. I was also interested in the details on: - construction of the HackrBlimp; is that a fill tube, shown at the end? Brief description of materials and assembly would be of general interest. DIY schematics would be neat. 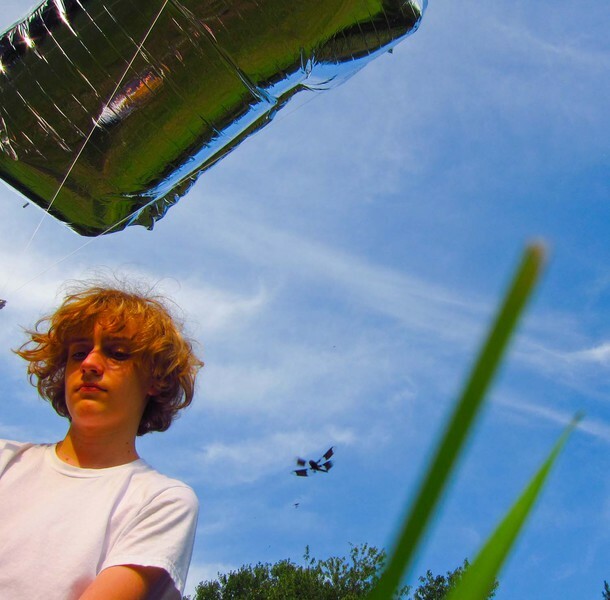 - Helium supply and availability observations, were you able to get it on short notice for your flight, or did you have it cached from before? - camera(s) connection to HackrBlimp or line and rigging details, e.g., use of the four connection points. - gps considerations; sounds like it was with Chris on the ground. Was there a constraint that prevented you from flying another gps with the cameras? Thanks for sharing these nice results. Pat, I agree that details of the construction of the HackrBlimp would be of interest. That blimp cost less than US$10 and performed very well in some windy conditions. The seams are quite strong. I have some photos if someone wants to use them in a note. I did not hear the final cost of helium, but it sounded like a filling of the 5+ foot diameter neoprene balloon cost about $40 and had great lift with a dual camera rig. I did not sense that it was hard to procure helium. The reason we did not fly a GPS with the cameras is than Don did not offer his Garmin watch!! Having the 3D track of the balloon path is very cool, but I fail to see how the data could be used in any meaningful way. On the other hand, having a good GPS track of something on the ground that is visible in the air photos could allow better geolocation of the photos. Chris: it'd be good to grab any additional photos you have of the blimp -- we can post those in a research note soon, as well as details re: the seams and the rigging. The cost of helium was $50 for an 80 cu ft tank (plus a $100 deposit); we went through a local supply company (Ivey Industries) that was able to provide helium with a few days' notice (and I think they would've provided it on yet shorter notice). Chris -- alas, my Garmin watch was in a box nearby, eager to fly, but forgotten by me. Next time! Re: GPS data -- I just grabbed these boards from Adafruit: an RGB color sensor (http://www.adafruit.com/products/1334), as well as a sensor that has both full-spectrum and infrared diodes (http://learn.adafruit.com/tsl2561). I also have a GPS breakout board (http://learn.adafruit.com/adafruit-ultimate-gps). Would it be useful for calibrating & geo-referencing these photos to have an Arduino-based prototype that e.g. records GPS as well as R,G,B, NIR sensor data? Thanks guys, sounds like more will be coming soon and we'll all welcome the results. Don, I think it would be very useful to have an an Arduino-based prototype that records GPS as well as R,G,B, NIR sensor data. Re: why fly a gps? While it is different from the the artisanal, hand-crafted maps we make with Mapknitter or desktop tools like PhotoShop, there are at least two cloud-based for-fee services that take sets of geotagged images and produce georeferenced maps and digital elevation models, e.g., Dronemapper.com and Pix4d.com. For some users, willing to pay, this approach can enable them to quickly get map results of their flights. Glad to hear you can get helium, essentially on demand. Hasn't been that way in the Bay area, but I haven't checked recently. Re a GPS on board with the cameras, I'm trying to understand how one would use that to georeference an image in GIS with good accuracy. I'm used to the traditional GIS georectification method where you have ground control points (at least four, hopefully more) that are in different locations on the image. So how would the GPS on the side work? I guess it would be associated with the pixel in the center of the image? Charlie, Some of the structure from motion programs that make 3D terrain models from aerial photos do not need any input other than the photos themselves (maybe including some EXIF data about the lens). These can take a long time to figure out how the photos overlap and eventually where the camera was for each photo. It took several hours to process the 76 photos for this model. If you give the program a hint about where the camera was for each photo, it can reduce computation time. I don't know how much this can improve the final result, because all the programs have to figure out the camera positions and orientations one way or another. But some programs will not work without GPS data for the camera for each shot. Pat, do those programs want x,y,z data? Do some also want orientation data (which way the camera was pointed)? Do these programs all make 3D models or is GPS data also used to make 2D maps from the air photos? Automatically stitching air photos into 2D maps with good ground control (georeferencing) would be an important advance over Microsoft ICE which does a good job stitching but can freely distort the photos to get them to stitch with no regard for geography. Chris, I'm not a expert user of the two cloudbased services, Dronemapper.com and Pix4d.com. I've only processed test cases. Pix4d.com, used to want the orientation data, but has relaxed the requirement. So both now accept images with the gps info coded into the EXIF info. Both make geo-referenced 2D mosaics and 3D surface models (with additional charges for the 3D models). These are not for everyone, but to me indicate where the professional surveying approach is going - fly the site, autoprocess the images, produce the map and model. There has been some discussion with Stewart and Jeff about whether our tools like Mapknitter could exploit the gps info, but not toward autoprocessing. To me, it's just another tool in the kit.